Boeing (NYSE: BA) has scheduled an unmanned test flight of a private space taxi to the International Space Station as part of NASA’s commercial crew program, the Space Reporter reported Sunday. 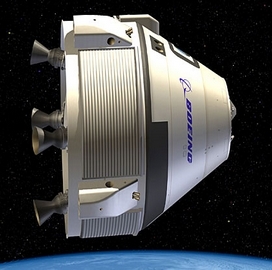 Annika Darling writes that Boeing plans to launch the CST-100 spacecraft in early 2017 from Cape Canaveral, Fla. on an Atlas V rocket. NASA aims to transport astronauts as well as cargo to the ISS by November 2017. “It’s been over 1000 days and counting since we landed [on STS-135], ” said Chris Ferguson, Boeing director for crew and mission operations, according to the Space Reporter. “As the next year progresses and the design matures and it becomes more refined and we understand our own capability … and NASA understands our capabilities as the space station program gets more involved — then I’m sure they will put the same rigor into our plan as they did into the SpaceX and Orbital Sciences plans, ” Feguson added. Sierra Nevada and SpaceX have also been working with NASA in order to provide commercial taxi services for U.S. astronauts.